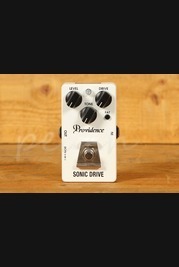 Providence provide a range of guitar effects pedals and are dedicated to producing equipment that enables artists to focus on performance by reducing the amount of stress related to a gig or studio environment. Their products are well designed, innovative and long lasting with their equipment used by big names such as Dave Ellefston, Bryan Beller and Pete Thorn. Order your Providence online today, if you'd prefer to try before you buy then head on down to our store based in Colchester and we will be happy to assist. Our team of experienced guitar enthusiasts are always on hand online and in store to answer any technical questions and to help you find the right product. Don't forget, if you order online and spend over £100 you'll enjoy free Next Day Delivery on orders placed before 3pm.